With the increasing number of customers that conduct business over the Internet or other untrusted networks, there is a rising demand to protect data traffic. 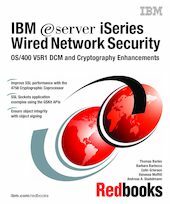 This IBM Redbooks publication focuses on the network security enhancements that are introduced with OS/400 Version 5 Release 1. You learn how to implement and use the new object signing capabilities, so Business Partners and customers can distribute objects over an untrusted network while assuring their integrity. You are guided through the redesigned Digital Certificate Manager (DCM) with its new functions, such as Certificate Revocation List processing. For the e-commerce world, availability, security, and performance are critical to business. This book introduces the new 4758 Cryptographic Coprocessor support, which helps improve SSL performance and security. It takes you through the cryptographic coprocessor configuration and explains how to use it by DCM. This book introduces the new Global Secure Toolkit (GSKit) APIs that provide better functions and more flexibility when writing SSL Sockets applications. You’ll find sample code written in ILE RPG to introduce these new APIs. This is the first publication to provide complete information about the supported encryption and authentication algorithms and key lengths. It shows how to control your Web server to accept certain ciphers for a secure connection using the new SSL directives.